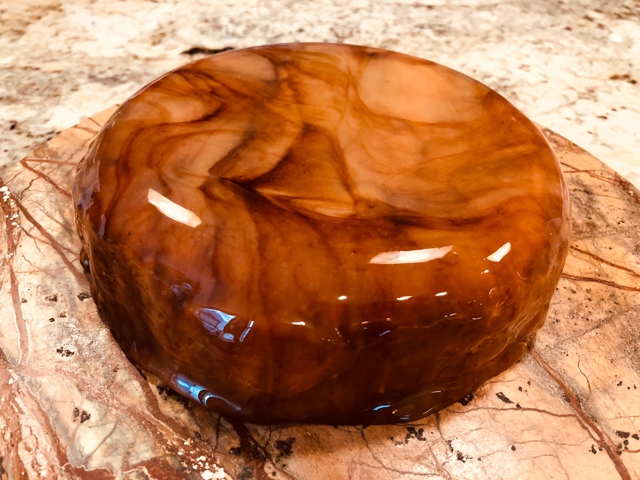 Pushing a little bit the boundaries of my comfort zone, with this cake I practiced making a pattern on the sponge component, baking a mango-flavored meringue, and using a gelatin-based topping. 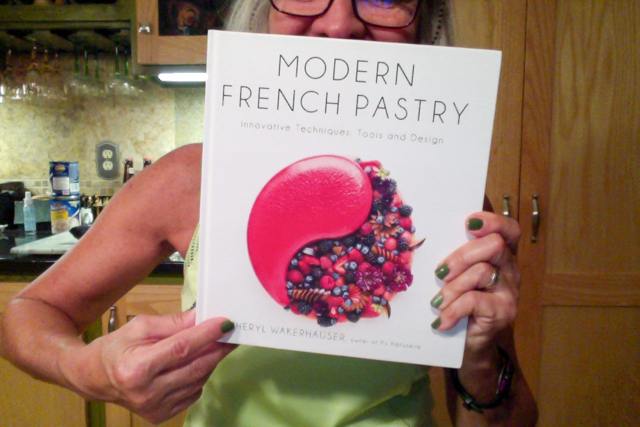 The basic recipe was from the book Modern French Pastry. 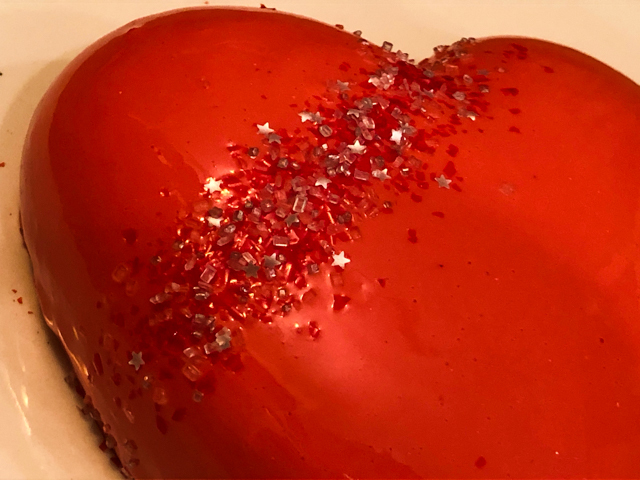 The cake, called Moulin Rouge, is a looker. I modified the recipe quite a bit, so I share my version with you. Make sure to read my comments, as I consider this cake still a work in preparation. Mix the butter and sugar in a Kitchen Aid type mixer with the paddle attachment until creamy. Add the egg whites very slowly, a little at a time. Clean the sides of the bowl often. Add the flour and gently mix on very low-speed, then add the food dye. 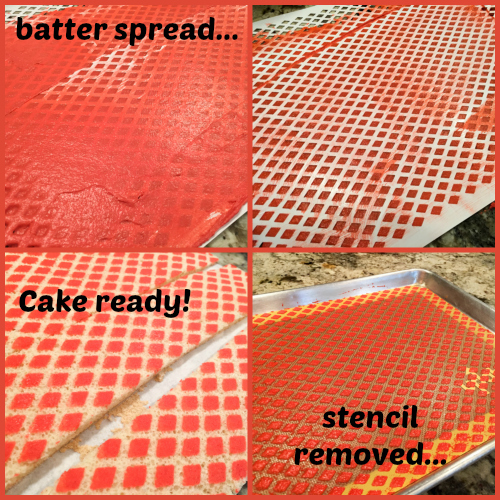 Lay the stencil you intend to use on a Silpat, or if drawing a pattern free-hand, lay the design on parchment paper to make it easier to draw with the batter. Brush the batter on the stencil, then scrape all excess off with a bench scraper. You will not use all the batter made, but it is easier to work with more than you need. Gently pull the stencil up. See my composite photo under the recipe. Freeze the design for an hour or so. You can do this step the day before. Do not remove from the freezer until you are ready to bake the cake layer. Heat the oven to 400 F. Add powdered sugar, flour and almond meal to the bowl of a mixer. Mix gently to incorporate them. Add the eggs and beat on high-speed for about 5 minutes, until very fluffy. Reserve. Make a meringue with the egg whites and sugar, bringing it to soft peaks. Start with the egg whites in the mixer on low-speed, increase to medium, once you see a trail forming as the mixer is going, start adding the sugar slowly. Once you get to soft peaks, stop. Over-beating the meringue will make it hard to incorporate it in the cake batter. Gently fold the meringue on the egg-flour mixture that you reserved. Add a bit of the mixture to the bowl with melted butter, mix gently. Pour that into the cake batter and gently fold. Remove the stencil design from the freezer, pour the batter over it, trying to level it as best as you can with an off-set spatula. You want to keep the air incorporated in the batter, so be gentle. Run the spatula just over the surface, you don’t want to risk disturbing the pattern underneath it. Bake for 12 to 14 minutes. You need to start noticing a little browning on the surface, but not much. If you notice the edges getting crunchy, remove from the oven. Let it cool before proceeding. Heat the oven to 350 F. Trace two 8 inch circles on parchment paper, and place it over Silpat. 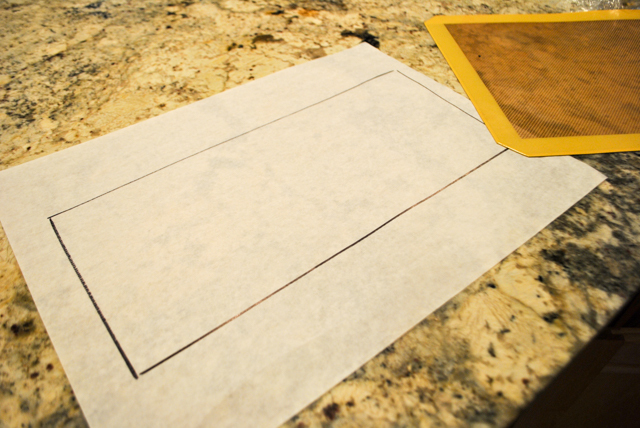 Prepare a large piping bag fitted with either a large (1/2 inch) piping tip, or just cut the bag with that dimension. Mix the powdered sugar with the pulverized mango and reserve. 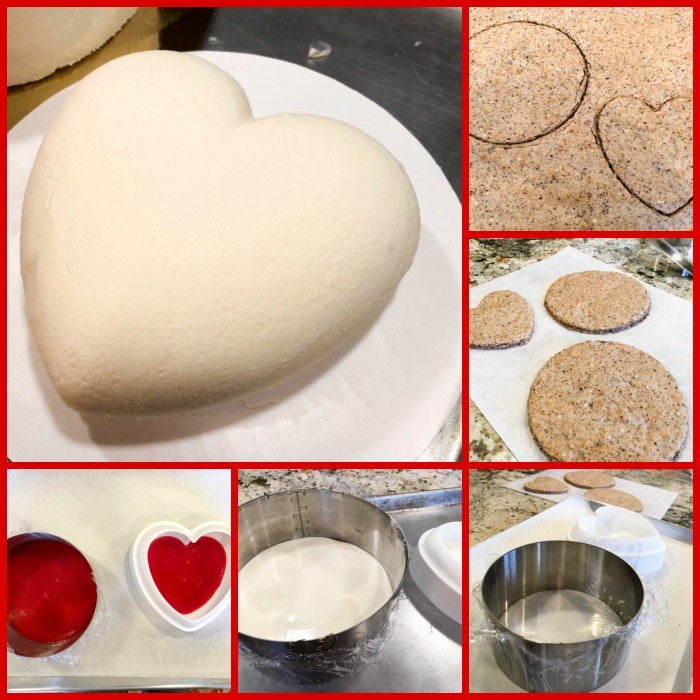 Make a meringue with the egg whites and sugar as described for the Joconde layer. There is a lot of sugar in this version, so you don’t have to worry about over-beating. Once you get to stiff peaks, mix the mango-sugar mixture, folding it delicately. Spoon the mixture in the prepared piping bag, and pipe it on the Silpat, in each of the circles, starting from the center. Leave a little border empty, as you want the meringue to be smaller than the diameter of the cake. You can see in the central picture of the meringue composite that the pencil drawing is about 0.5 inch larger. You could conceivably draw a smaller circle, but it is easier to see where you are and stop short, then risk going too much over it. Still, do whatever feels better for you. Bake for 20 to 22 minutes. Meringue should feel dry to the touch and just be starting to brown. 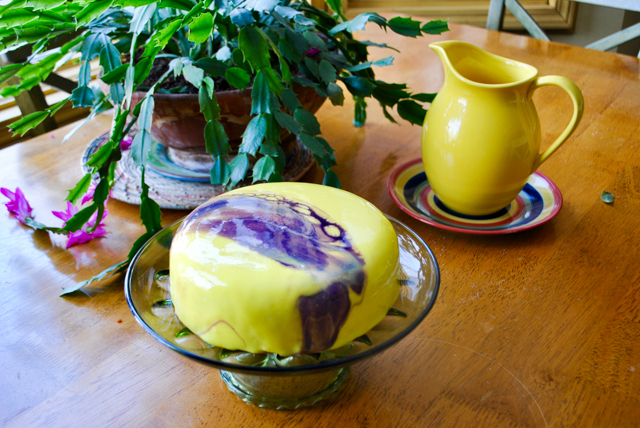 Combine gelatin with cold water and allow it to bloom for a few minutes. Place the strawberry puree in a saucepan, add the powdered sugar and mix gently over low-heat until warm. Whisk the cream in a Kitchen Aid type mixer to soft peaks. Do not over-beat. Reserve. 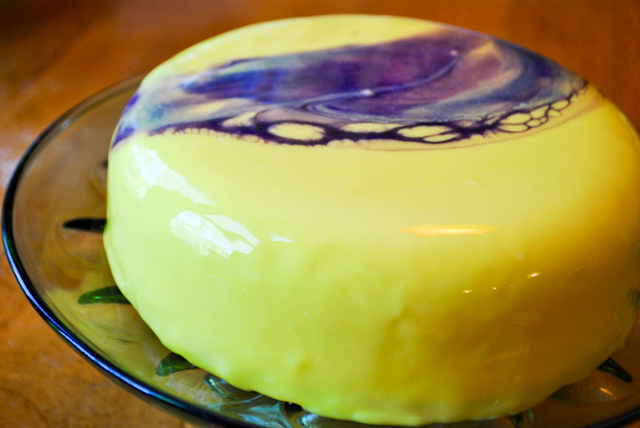 Melt the gelatin in a microwave, in very short bursts, keeping a close eye, as you don’t want it to boil, just melt smoothly. Add some of the strawberry puree to the gelatin to incorporate it in, then pour the mixture into the rest of the puree. Mix gently, but well, you want the gelatin to be fully distributed throughout the fruit. Add 1/3 of the puree to the whipped cream, fold. Add the remaining of the puree, fold gently. The mousse is now ready to use. Combine the gelatin with water to bloom for a few minutes. Heat the soaking syrup, add the gelatin and stir until fully melted. Slowly stir the strawberry puree, and the food coloring, if using. Refrigerate until needed. 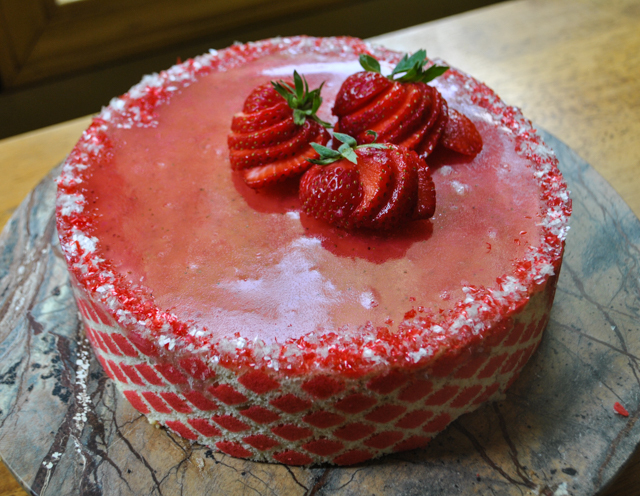 When ready to finish the cake, warm it in a microwave in very short bursts of heat, until it’s about 90 F.
Dust the cold Joconde cake with granulated sugar. Place a parchment paper on top, and flip it. Remove the silicone sheet slowly, and marvel at the pattern that you see! Now you need to decide the dimension of the cake strips. In the book he recommends 1.75 inches, but I did about 2 inches. 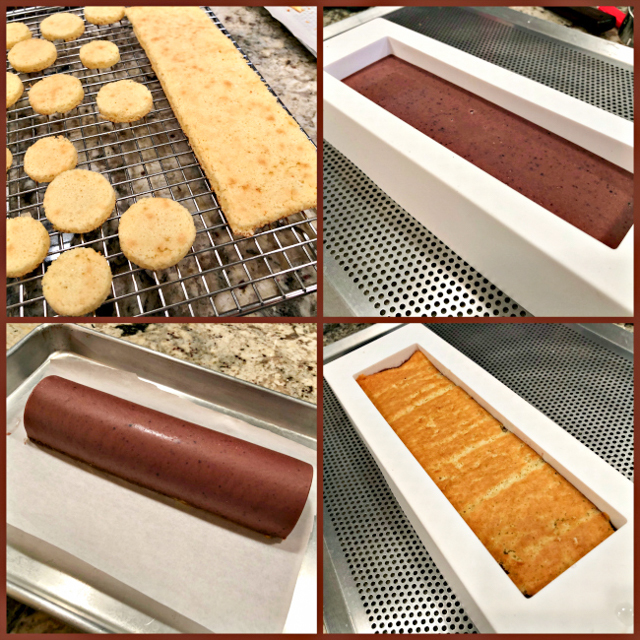 You need two strips of cake with the exact same dimension, and they will go around the perimeter of an 8-inch diameter cake ring. 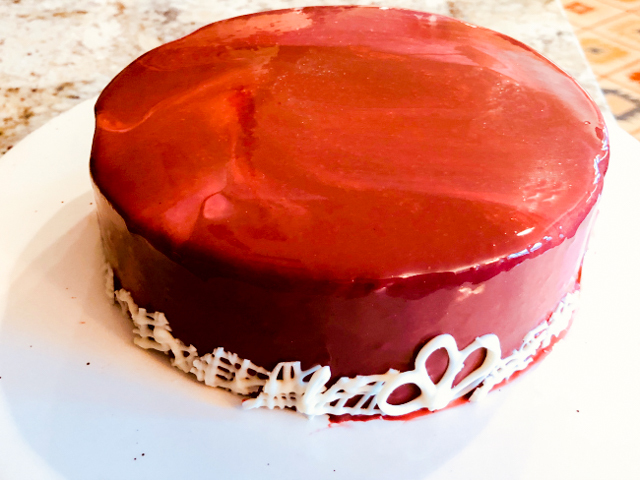 With what is left of the cake, cut one circle a little smaller than 8-inches in diameter, as it will sit inside the perimeter laid by the cake strips. 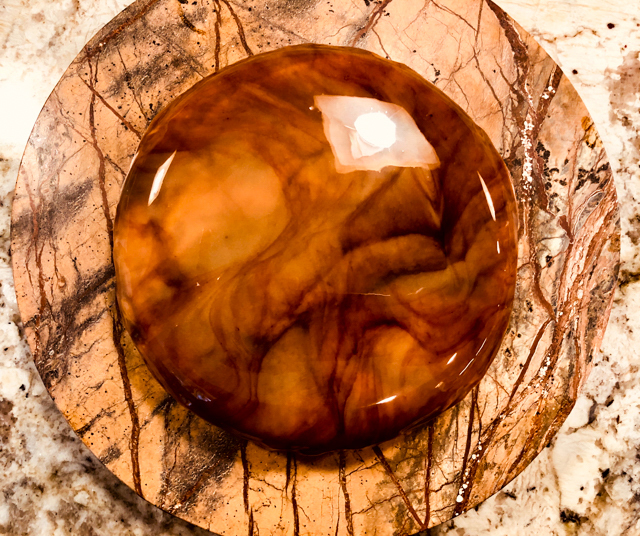 Place an acetate strip inside the cake ring. Lay the cake strips with the design facing out, they should fit very snuggly, so it is best to allow them to overlap slightly, then force them into place. Now place one meringue ring at the bottom. Add one-third of the mousse over it. Top the mousse with the cake circle, the design can be facing up or down, it does not matter as you won’t see it. Add another third of the mousse. 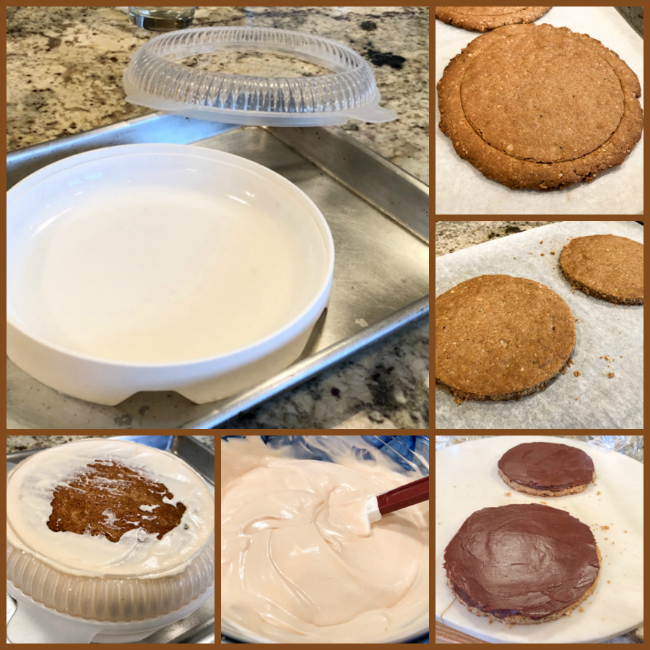 Place the second meringue ring on top, add the rest of the mousse, and spread as flat as you can, trying to make it almost leveled with the top of the cake strips. Freeze overnight. If needed, you can trim the top of the cake layer with scissors before finishing the cake. Remove from the freezer, and pour the warmed up strawberry topping. Do it quickly, as it will solidify. 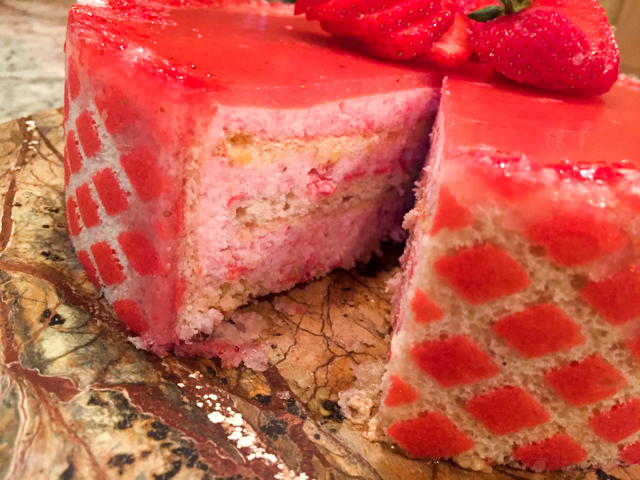 Remove the cake from the ring, pushing it from the bottom, gently but with authority… Place it on a serving platter, and decorate with freshly cut strawberries. Comments: You know that thrill of opening the lid of the Dutch oven and getting the first glimpse of the sourdough loaf inside? That is quite similar to the thrill of inverting the cake after baking, and peeling that Silpat to – hopefully – reveal the design. My heart was going at 100 bpm… The stencil I have is really big. I wish they made it in half-sheet size. I’ve been flirting with the idea of cutting it, as I will never need to lay such a huge pattern during my lifetime. Since it is so huge, I had to lay it over the Silpat on my countertop, with the stencil extending way beyond it, and making quite a mess on the granite. No way to avoid it, actually. But the process went more or less smoothly. I had to do it twice because on the first time I lifted the stencil too quickly and messed up the pattern on one of the sides. Live and learn. Once the pattern is laid and frozen, the rest should go smoothly. The cake batter is poured right over the frozen design before it goes into the oven. The meringue component was a bit challenging for me, particularly judging when the disk was properly baked. You do not want to have it too dark, because it gets brittle and breaks when moving it around. But under-baking is not a good idea. Mine was slightly over-baked in parts, but not fully baked in the center. I need to get a better “feel” for it, and also practice the piping to get a more uniform surface. Still, since the disk is hidden in the final dessert, any catastrophic events becomes a secret between the baker and the cake. What happens in The Bewitching Kitchen, stays in The Bewitching Kitchen. I had to modify quite a few details in the recipe, mostly because the texture of my meringue was far from perfect. I strongly advise you to get the book if you enjoy this type of baking challenge, and try their version. Their meringue is flavored with coconut and black pepper (yes, you read that correctly). And they also add another layer of complexity with some jam. I say no more. You must get the book. Which, by the way, has one amazing recipe after another. Like the one in the cover, yin and yang of mousse and fruits. Can you imagine bringing that to the table after a dinner party? When I make this cake again, I will substitute the meringue layer for something else. Maybe a genoise with praline on top for texture. I have to agree with my friend Jennifer, that the meringue does not freeze as well as a sponge cake. 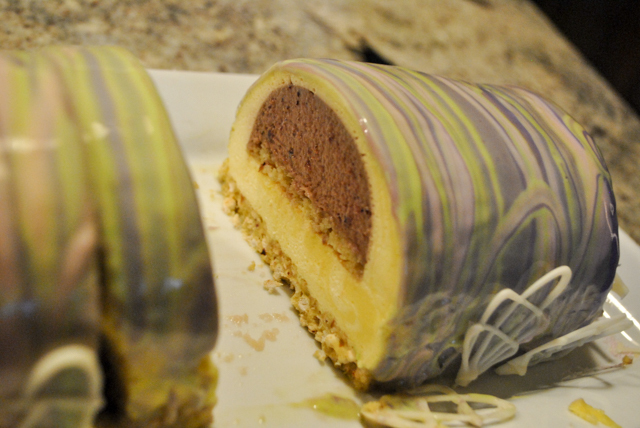 For this type of entremet that needs to spend hours in the freezer, I think sponge layers work better. 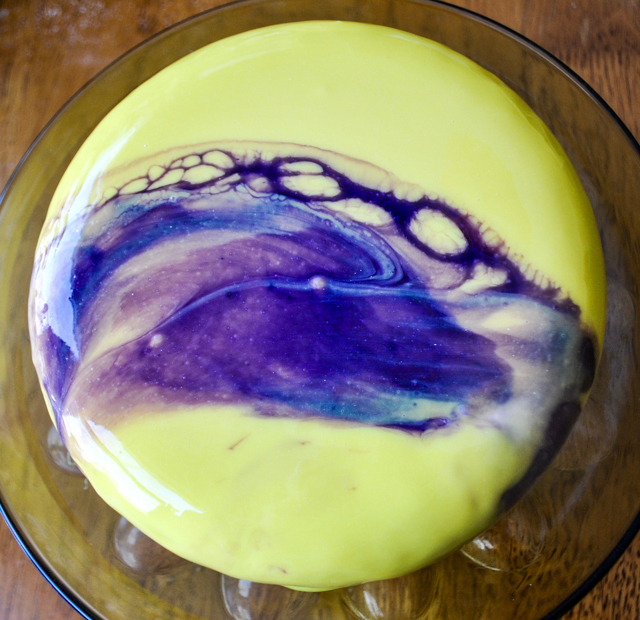 I cannot believe I am considering modifying a pretty complex cake recipe but… strange things happen in the universe. We are living in a twilight zone in ways that go beyond politics (wink, wink). 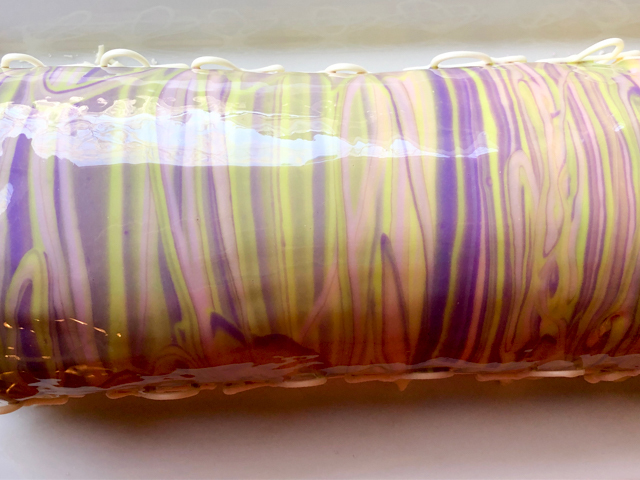 The topping reminded me of a mirror glaze, because you need to exercise patience and wait for it to cool to below body temperature. 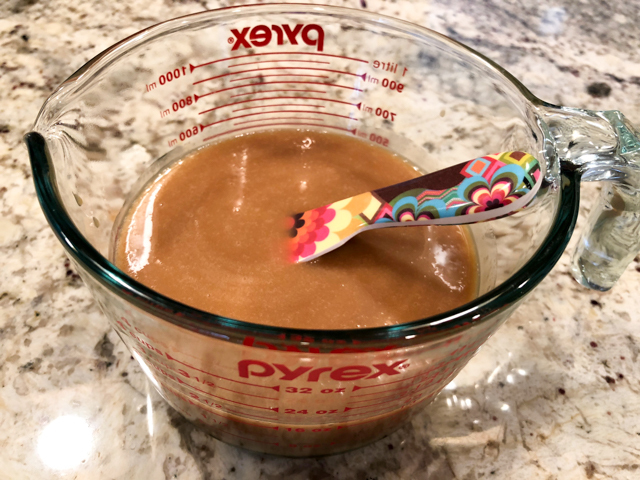 I actually find it easier to make it the day before, and warm it up for a few seconds at a time in the microwave, with super gently mixing (no whisking! ), to avoid bubbles. Then it will be just a matter of minutes until you are done. Well, not actually you, but the cake. 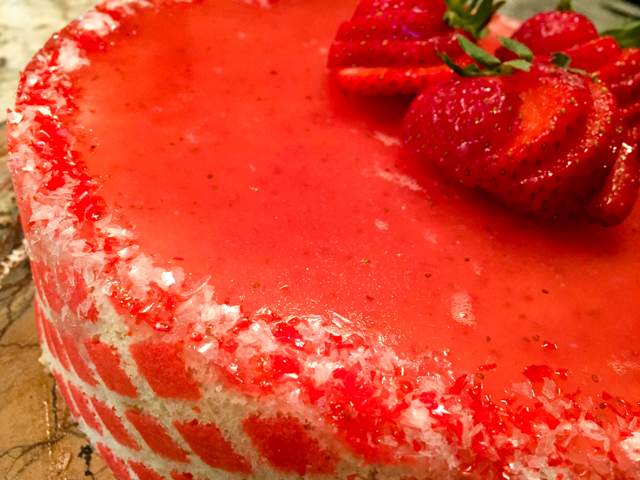 The edges of my cake did not look as perfect as the picture in the book, so I added some sparkling sugar. Nothing like a little sparkle to cover sins. The flavor was spectacularly strawberry-ish, and the mango in the meringue a subtle added tropical bonus. By the way, when I was processing the dried mango to add to the meringue something quite funny happened. As I opened the processor, a fine dust of mango powder hit my nose. I got a severe case of…. Hiccups. Pretty funny. It passed quickly, though, but just in case you process dried mangos, avoid getting a deep sniff of the powder. Or, go for a full sniff and tell me if you get the hiccups too. 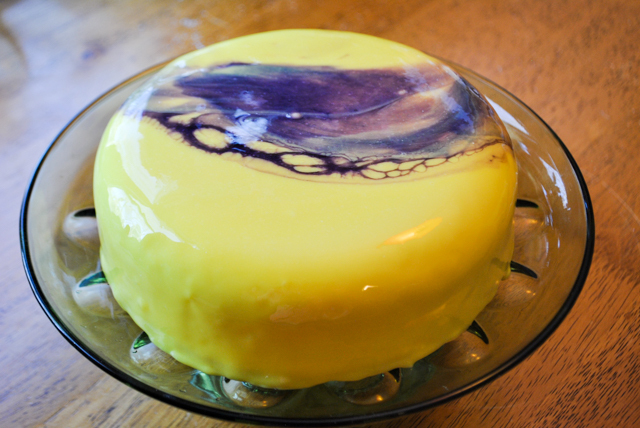 I feel I’m getting a little more comfortable with entremet cakes. The layers in this cake were better defined than my previous attempts, and the cake cut very nicely. Still, there is a lot of room for improvement. One cake at a time, I hope to get there. Entremets seem to be the rage at the moment. Originally, entremets were small portions of sweet concoctions served in between savory items in a multi-course banquet type meal. We are talking royalty stuff, from the Middle Ages to the overindulgence that was happening in France before 1789 (wink, wink). 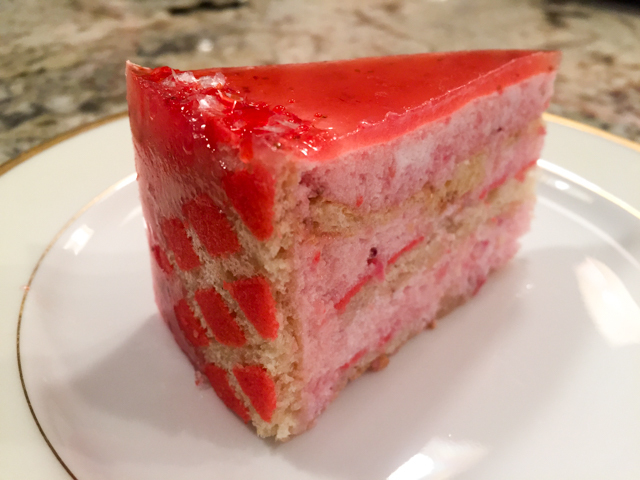 Nowadays, the term is applied to cakes that involve multiple layers with different textures and flavors. Basically it is a layer cake with severe superiority complex. 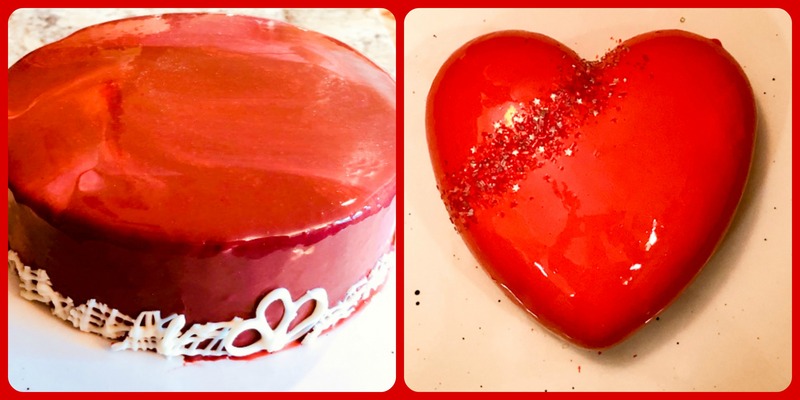 My version was closely based on a Craftsy class taught by Kathryn Gordon, Contemporary Layer Cakes. I don’t have permission to publish the recipe but will share an overview. The cake batter will be enough to bake one round 8 inch cake and you will have leftover batter to spread as a thin rectangle for the sides (for lack of a better term) of the cake. 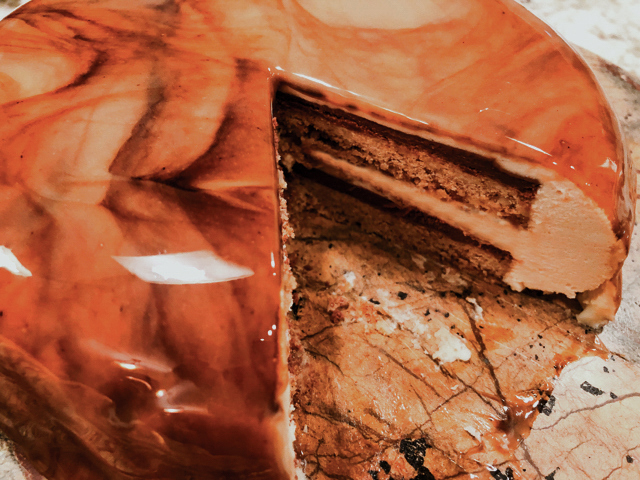 The round cake will be halved crosswise so that you’ll have two layers for the entremet. To line the pan, make sure you will have 2 pieces that will cover its whole circumference. You can use the mathematical formula C = π x D or cut a piece of string that goes around the pan, and measure it. 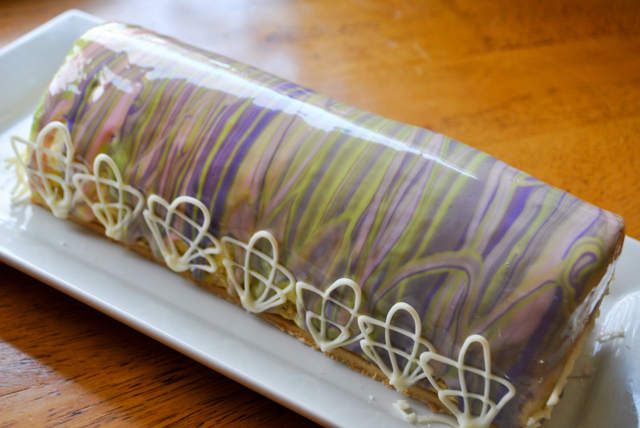 In any case, you will arrive at the need for two pieces of cake 13 inches long. The height depends on how tall your cake will be in the end. Make it around 6 inches so you have some flexibility. The top can be trimmed once assembled. I placed a Silpat on top of the paper and spread the cake batter on it, using the drawing underneath to guide me. 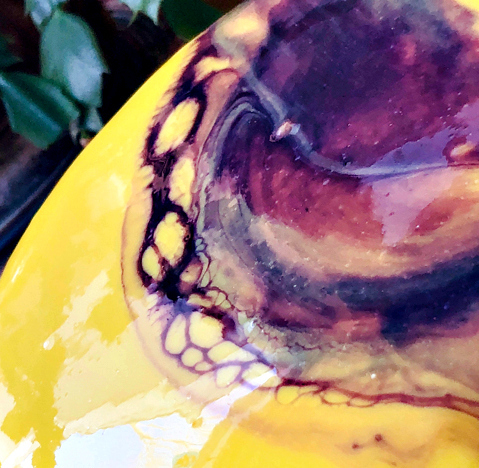 For the marble effect you have two options: paint some food color on the Silpat and pour the batter on top, or divide the batter in two portions, add orange food color to half, and pour the two batters together, spreading them gently so that the color is not fully distributed. I prefer the second method because it gives a much more subtle effect. But, if you are in a Pollock frame of mind, go wild with a brush. In the center you see the full rectangle of very thin cake, that was split in half lengthwise and placed inside the ring. Those are technically called “sponge strips” and I thank Gary, patissier extraordinaire for enlightening me. Please keep in mind that the photos are not on the same scale. The cake is assembled inside an 8-inch ring. First the sides are set in place, with the swirl facing the outside. Then the bottom layer. Blood Orange Cremeux: cream made with 8 egg yolks tempered and cooked with 360mL heavy cream previously infused with the zest of two blood oranges and 3/4 cup of blood orange juice. 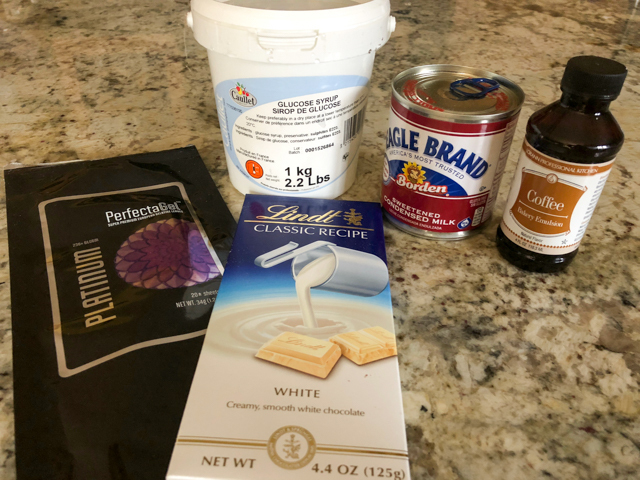 Once the mixture coats the back of a spoon, it is poured over 200g white chocolate and 6g sheet gelatin, softened in cold water. Caramelized rice cereal: 1/4 cup sugar is heated in a heavy pan until amber. To that 1/2 cup popped rice cereal is added, quickly mixed and poured on a Silpat or parchment paper. Caramelized blood orange segments: Make a syrup with 100g sugar and 4 tablespoons water. Heat until fully dissolved, then pour over the segments of one blood orange. Let the fruit sit in the syrup until cold, drain before using in the cake. To the bottom cake layer, a little cremeux is added and spread. Then pieces of caramelized puffed rice. 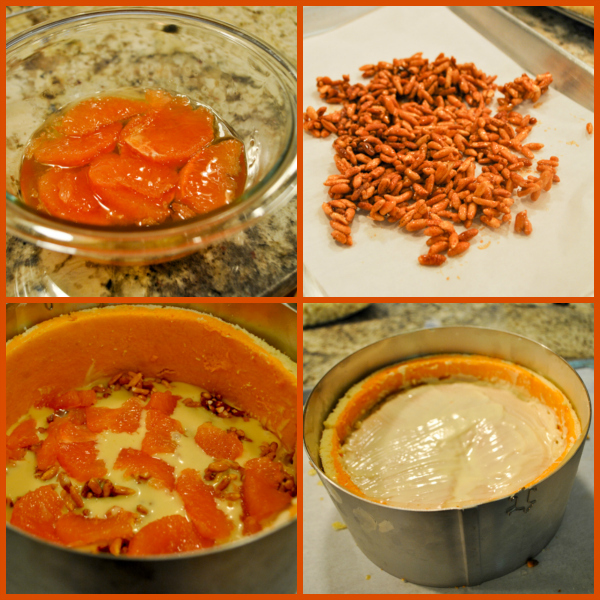 A bit more cremeux, caramelized orange segments, and more cremeux on top. The second piece of cake goes over it, pushing down to make sure it’s all well compacted. 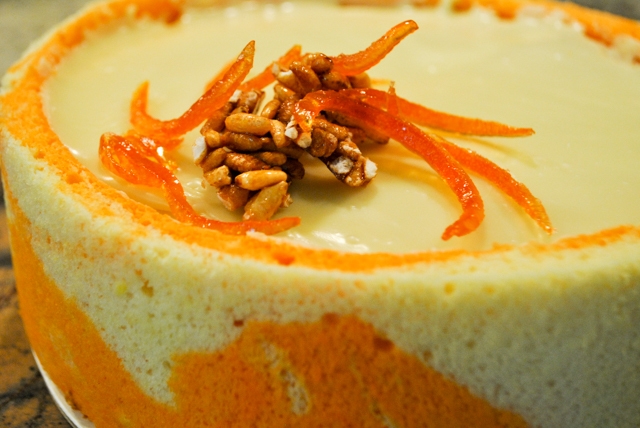 The top of the cake is brushed with a bit of melted white chocolate and oil, to seal the layer. 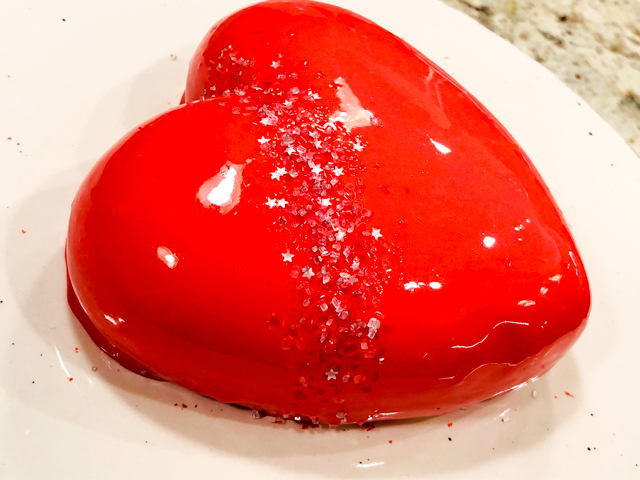 The whole thing is frozen for several hours, then the cake is covered with a very thin layer of white chocolate mirror glaze, made with sugar (50g dissolved in 2 T water), heavy cream (2 T), corn syrup (1 T) and white chocolate (150 g). Kathryn explains exactly how to do it in a way that the top will be very smooth. 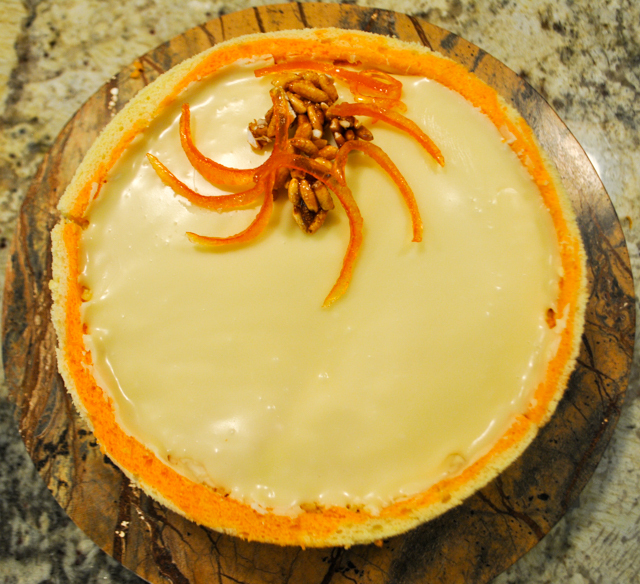 The cake is then removed from the ring, the top edge is trimmed, if so desired, and the top is decorated with bits of caramelized rice cereal and blood orange zest. Comments: First of all, my apologies for not posting the full recipe, but without permission to do so, I cannot do it. 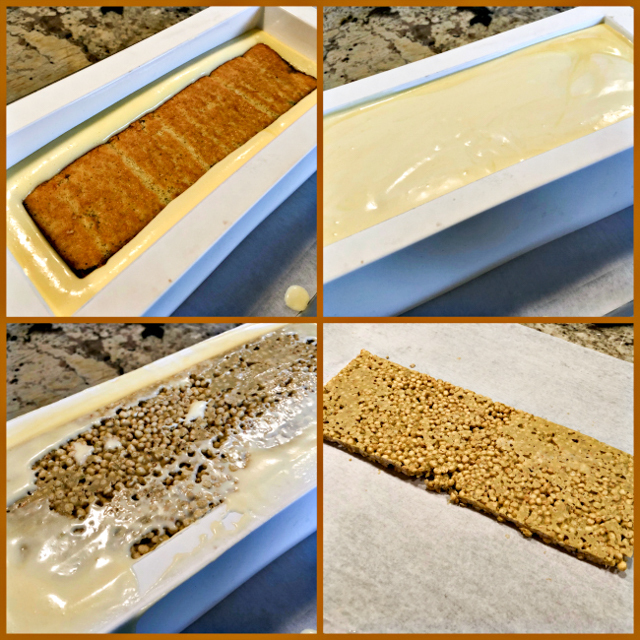 You can find the basic method of preparing a Jaconde sponge, as well as all other components online. 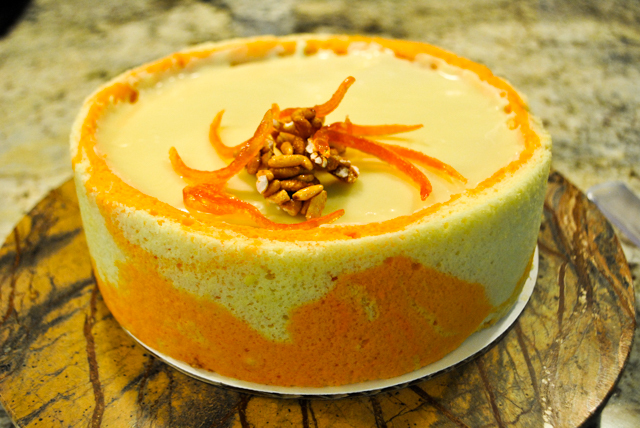 In fact, many different cake formulas and fillings will work to produce a similar entremet cake. All you need to keep in mind is a contrast of textures and flavors. The blood orange cremeux turned out very refreshing, so even considering this is a rich, indulgent dessert, it had a light and bright quality to it. Rice puffed cereal is a good alternative to the famous Gavottes cookies that were part of my recent Gateau Royal. You can definitely caramelize it and use it to add crunch to any layer cake. Those things are sold in huge bags, and we don’t eat puffed rice as a cereal, so I see a few aventures with this caramelized version in my future. This Craftsy class by Kathryn is really wonderful, because not only she explains every single step of the recipe in real-time, but she encourages you to plan and make your own version of this elaborate cake. Although it might seem a bit too involved, each component can be made in advance. 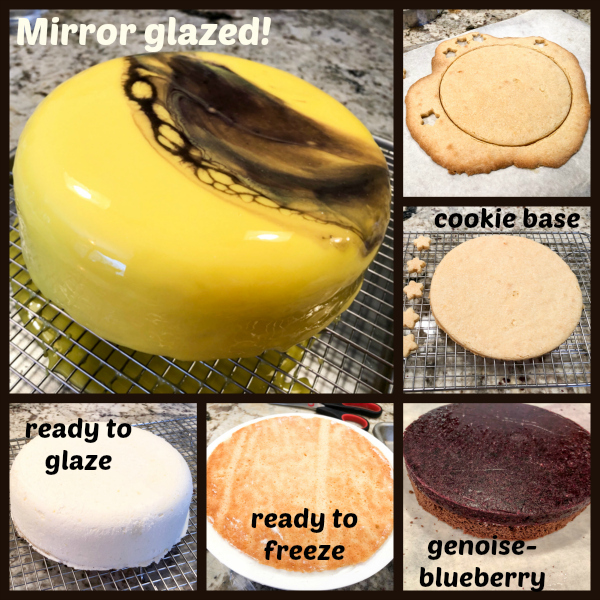 I actually baked the cakes and made the cremeux on a Saturday, the other components Sunday morning, assembled the cake, froze it, and added the mirror glaze in the end of the day. Piece of cake! (Literally). 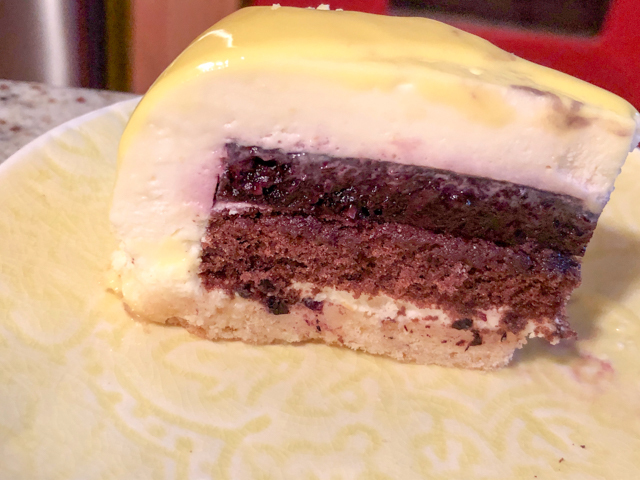 Just like macarons are my favorite cookies, I suspect entremets are quickly becoming my favorite type of cake. 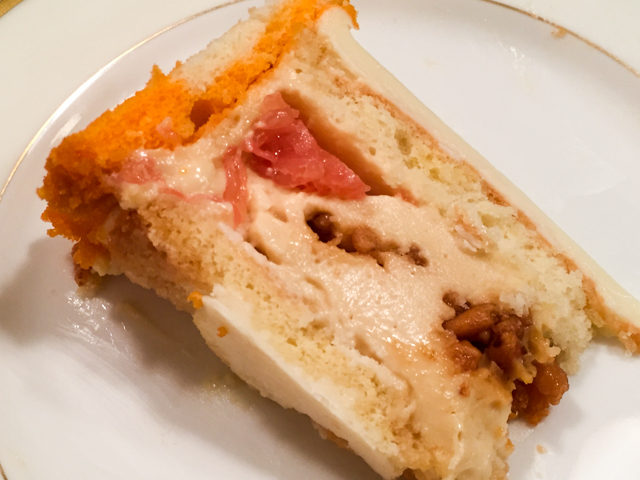 The possibilities of cake, fillings, textures, and icing are endless.